Their shakes have been around for quite some time with the usual chocolate, vanilla, and strawberry (strawberry being the best in my humble opinion) always available and with specialty flavors such as orange cream, very berry, Neapolitan appearing from time to time. Longtime Del Taco fans will remember that orange used to be a permanent choice and people still often search for "del taco orange shake." I've had the strawberry lemonade a few times in test stores and it is now available at all locations. So when you go to Del Taco keep in mind that there are many beverage options available. Read about their other new menu items (the chewable kind, not the drinkable kind) by clicking here then scrolling down a bit. If I even mention what they are in this entry it'll get the search engines all confused so be adventurous and give it a little click. UPDATE: Peña's has closed down. I first read about Peña's in the Register a couple months ago. I clipped the article in anticipation of making a trip there someday. When I was able to make it there a few days ago I kept thinking in the back of my mind, "That seems to be pretty close to where Nancy Puebla's is." When I got there I found out it actually is in the same spot formerly occupied by Nancy Puebla, and it used to be at least one other taco place before that including "Ruben's Tacos y Mulitas." Hopefully this game of Mexican taqueria musical chairs will stop now because Peña's has some of the best pozole verde I've ever had. This soup was recommended in the Register article so it was one of the things I was looking forward to trying. 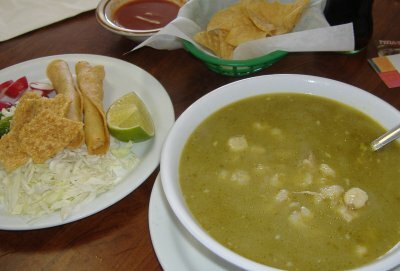 I couldn't tell from the article if it was a small, appetizer-size serving of soup or a full meal size and I couldn't find it on the menu once I arrived so I just asked for pozole verde figuring if it was just a little bowl's worth then I'd also order an entree on top of it. So let me tell you that Peña's pozole verde is a full-size meal. 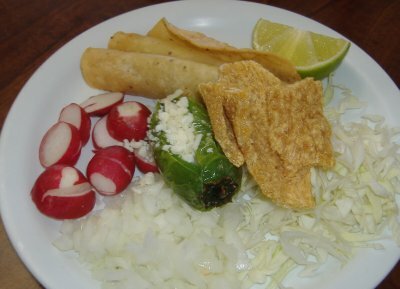 Even its condiment plate has chicharrones, a cheese-stuffed jalapeño, and two potato taquitos in addition to the normal onions, cabbage, and radishes. Click here to see the unedited album (8 photos) at . 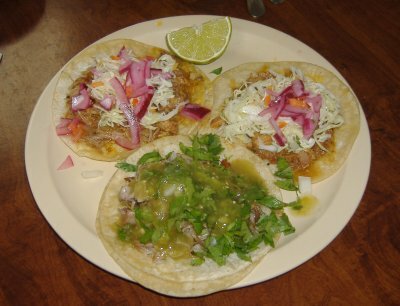 The cochinita pibil tacos were topped with cabbage and what appeared to be pickled red onions while the carnitas taco was topped with onions and cilantro and a salsa verde. Both flavors of taco were excellent and I like that Ramon and Lourdes Peña (husband and wife owner team) know how to cook each kind of meat just right then top it with complementary toppings. Oh, and they had the arroz con leche this time (can be seen in the flickr album linked to above). Here's another entry where I cover some stuff that doesn't fit neatly into a standard restaurant review. If this is your first time here don't let this entry throw you off; we really do have tons of reviews of Mexican restaurants, in fact over 200, so just keep scrolling down. Mexican restaurants I've been to for non-review purposes since the last roundup entry include: Taco Bell, Avila's el Ranchito, Cancun Fresh, Wahoo's, On the Border, Taco Rosa, El Pollo Loco, Javier's, Taleo, La Salsa, Del Taco, Sharky's, Tia Juana's, Rubio's, Taco Factory, Gabbi's, El Torito Grill, Chipotle, El Matador, Rancho del Zocalo, Azteca's, Taco Adobe, Cafe Maiz, and Carnitas la Villa. Non-Mexican restaurants I've been to since the last roundup entry include but are not limited to: Daphne's Greek Cafe, ESPN Zone, River Belle Terrace, Tommy Pastrami, Toshi's Sushi, The French Market, Ralph Brennan's Jazz Kitchen Express, Inka Grill, Chick-Fil-A, King's Hawaiian, Mugen Japanese Cuisine, Chinese Gourmet, Lola's Ice Cream & Deli, Knowlwood, NYC Cafe, BJ's Pizza, In-N-Out, Nalu's Island Grill, First Class Pizza, Todai Seafood Buffet, Duke's, The Olive Garden, Ruby Palace, Red Robin, and Watson's Drug Store and Soda Fountain. 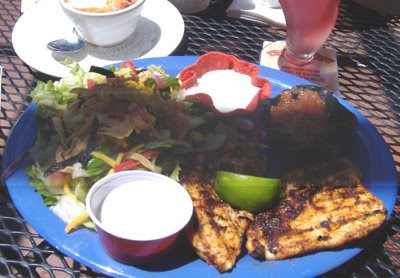 Here's a picture of my Ensenada Chicken Platter from Red Robin, "Two tender, juicy chicken breasts basted with a zesty Mexican blend of seasonings, charbroiled and bursting with Baja-style flavor. Two tender, juicy chicken breasts basted with a zesty Mexican blend of seasonings, charbroiled and bursting with Baja-style flavor:"
"picture of person turning into mexican food"
"are desserts from taco bell bad for you?" Also, I updated my entry on Frieda's. And, last but not least, I've been informed by the webmaster at Yum Tacos! 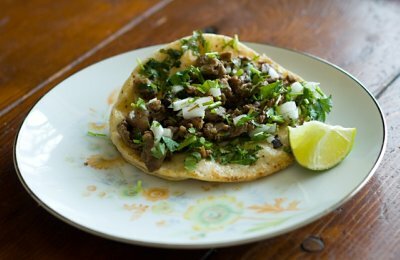 that the Sacramento City Council is taking measures that are attempting to put taco trucks in the city out of business. 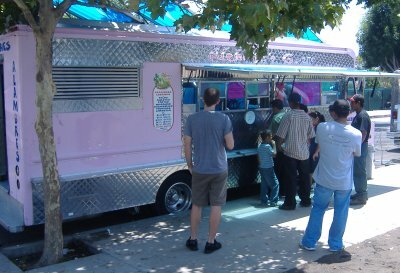 Now, Sacramento is far away but we don't want anti-taco truck sentiment to grow there and spread down here, so click the link and read the petition Yum Tacos is running to "Save Sacramento's Taco Trucks." Stopped by Gabbi's today and talked to Gabbi herself and found out that their basement room is finally open. The basement is something I found out about approximately two years ago and never saw it myself until about two months ago. I was asked not to mention it on the blog yet until now that they feel it's okay for the public to know about. 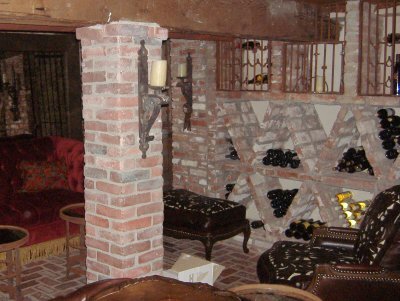 The basement is a special dining room that can be booked in advance for parties up to ten people in size. 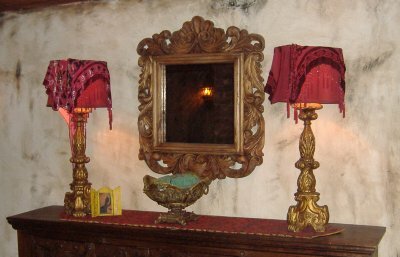 Different menu choices are available including selections from the regular menu or even higher end items that will never be found on the regular menu. I said to Gabbi, "So, if you book the room for one of these meals you should plan on spending about two and a half to three hours for a good meal?" She replied with, "More like six." Sounds like a feast to remember. This is something you do when you have just the right group together and you all want a culinary experience that will go down in the history books. 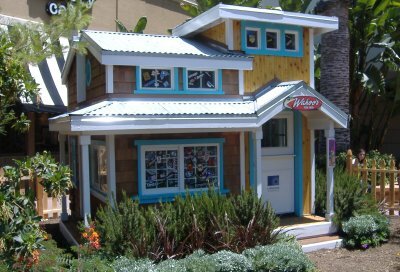 Call (714) 633-3038 and ask for Ed to get pricing and other information. Also, Gabbi's site (link above) has been updated to include a couple pictures of the basement as well as PDF articles from many of the magazines they have been featured in. Even more pictures of the basement can be seen in my photo album. Just CLICK HERE. 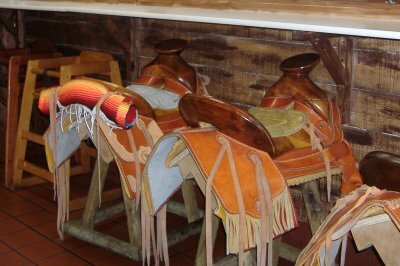 If you're new to this blog and looking for information on Gabbi's Mexican Kitchen please don't think this one entry is all we have, but instead CLICK HERE for our complete coverage including many photos. I was doing some work in South County and came across Celinda's. 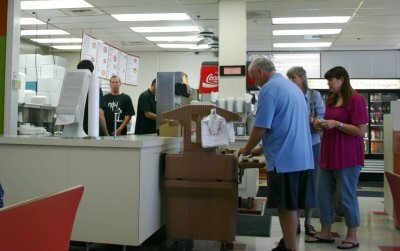 Out in Rancho Santa Margarita there isn't a lot of competition in the restaurant business that isn't a chain. So Celinda's is a nice surprise in a city with few non-chain options. They are located in one of those tilt up concrete industrial parks that pop up like mushrooms in Southern California. This one is kind of a mix of small businesses and fast food restaurants. Celinda's takes advantage of the lack of competition by trying to cover all the bases. You can get your food for dine in or carry out. They offer catering services and call ahead party orders. You also can buy an assortment of packaged hard taco shells, tostada shells, tortilla chips and salsas to go (or as it turns out to dine in. Celinda's doesn't serve chips and salsa with the meals but many people buy a bag of chips from the rack to snack on before their meal comes). The interior looks more like a quickie mart or catering business except for one wall (sorry no photos) with a mural painted on it. I have been here a few times and every time the place is very busy with a mix of people dining in and people picking up orders to take away. 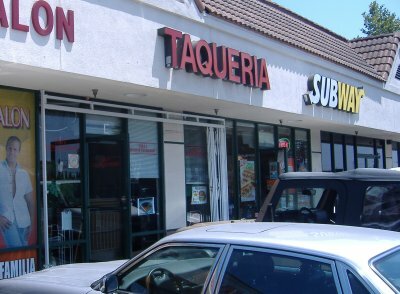 They have all the usual Mexican fare - tacos, burritos, quesadillas, enchiladas and combo meals. Combos run $6-7 dollars with rice and beans. So they are pretty reasonably priced. On my most recent visit I tried a pretty standard Mexican combo - the cheese enchilada and hard shell taco. My taco was filled with carne asada ( you can pick your filling). Both entrees were well made but pretty standard fare. Nothing really surprising or sublime. The enchilada was filled with jack cheese, then covered with a classic enchilada sauce that was a little watery (maybe because it was nuked) then topped with cheddar cheese. The beans were almost soupy like a thick puree. The taste of the beans was the most memorable taste of my meal. They say only the tamales are made with lard, maybe they put some bacon in these instead. They were also easy to doctor up with some of their chile de arbol hot salsa. 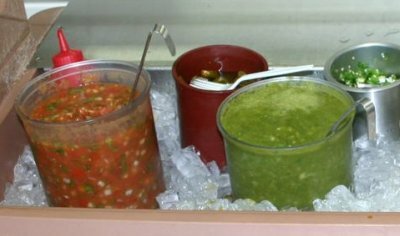 Their salsa bar has 4 different fresh salsas along with fresh and pickled jalapenos, limes and hot sauce. A salsa bar is being pretty close to a requirement for a good Mexican place. Good to see a fresh one here. 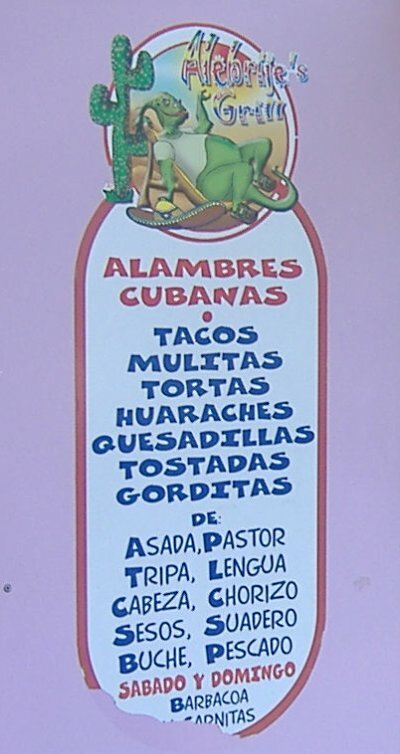 On a previous visit I had one of my favorite items here - the chile relleno burrito. 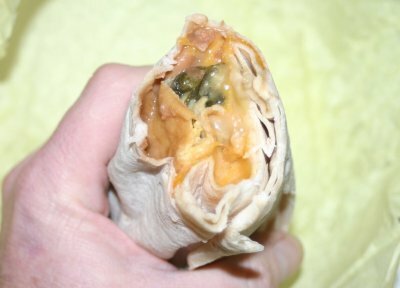 It is a standard chile relleno wrapped inside a tortilla with beans, sauce and more cheese. You don't find the chile relleno burrito just everywhere and it is a real specialty here. In fact, I think it is the most distinctive item on a menu that can be a little too safe sometimes. Celinda's would have some stiff competition if they were in my neighborhood where there are a couple of dozen great Mexican restaurants within a mile radius. 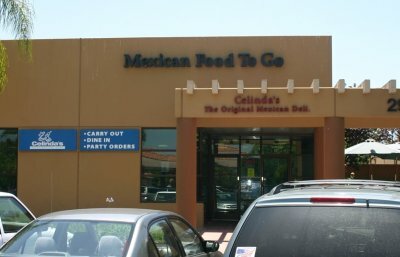 But for part of the county dominated by Taco Bells and Pizza Hut, Celinda's is an oasis in the desert. They'd be a 3¼ to 3½ Speedy place in most areas but for the salvation they bring to the hinterlands and the damned good chile relleno burrito I give them 3¾ Speedys. Was at the Irvine Spectrum earlier today and saw this unusual sight, the smallest Wahoo's ever. 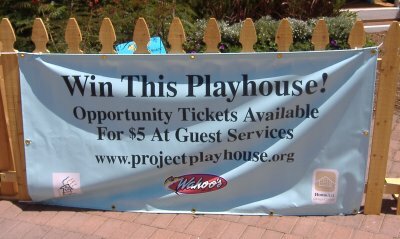 As I checked it out more I saw that it's actually a playhouse you can win in HomeAid Orange County's 17th Annual Project Playhouse for your kids. I think if you win it then your neighbors will come to it hoping for you to make them some Beach Mex food. 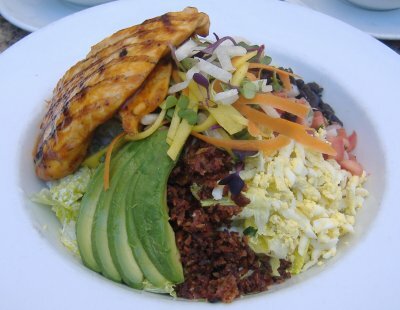 This salad was very light and fresh, but with the bacon and chicken there was enough protein to fill me up. 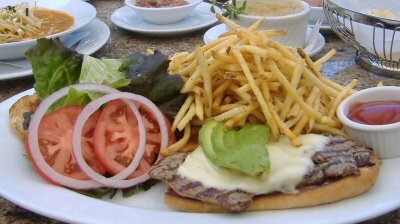 Greg went for the New York Steak Torta: "Tender New York strip steak on a toasted telera roll topped with leaf lettuce, tomatoes, red onions, avocado and melted Monterey Jack cheese." Excellent lunch all the way around. Each is "served on warm corn tortillas with toasted cheese, slices of fresh avocado, habañero citrus salsa and chipotle picante sauce." I just went and got the Gourmet Taco Plate with the shrimp taco and the mushroom taco. And they gave me a coupon for a free drink the next time I go back and get a gourmet taco from there again. I grew up in Capo Beach, lived there for over 40 years, and have been a customer of El Patio since 1960. In all those years I've never been disappointed with any aspect of what they do. That's something, because I'm picky. This restaurant is in the same spot, and is still owned by the same family, since its inception in 1953. 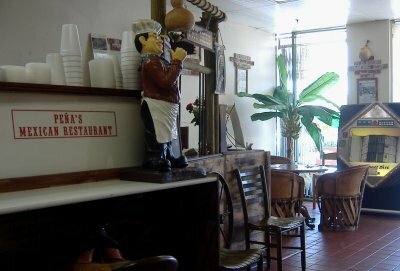 For years the seating area consisted of just the counter and the handful of tables in the original building out front. Some years back, they added patio dining behind the place, but true to form, I've never dined back there. I insist on keeping to the familiar confines of the front. 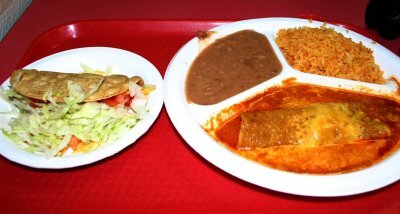 My favorite items are the flour beef tacos, cheese enchiladas, chiles rellenos and fish tacos. The house salsa is a flavorful red sauce, with just enough heat to make my capsicum receptors happy. 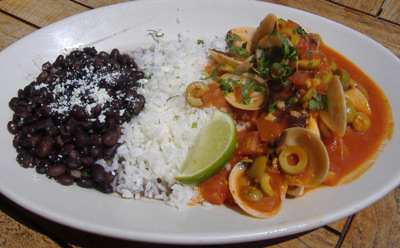 If you want a chunky pico de gallo type, have your server bring you a cup of "Jackie's" salsa. It's usually not on the menu. 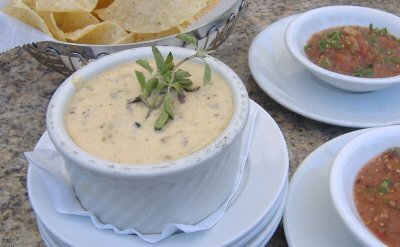 The eponymic nature of the salsa refers to it being the recipe of one of the owners, Jackie, son of the restaurant's late foundress, Lucy Chavez. There's a large dirt parking lot next to the place, very handy to have as they pack in the diners on a regular basis. You can expect SRO and a line just about any night of the week. Call for their hours of operation, as they can be a bit strange. They're open for lunch also. I know they serve beer, but I'm not sure about the wine, as I'm not a wine drinker. This is old Capo Beach at its best, and about the only survivor of what it used to be like. To me, it's like going home. 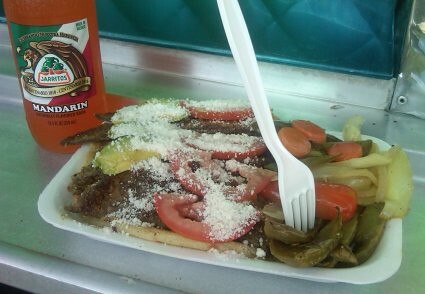 What's a Mexican food blog without a review of a taco truck? 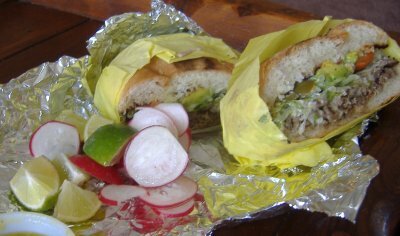 This blog has been around for two and a half years now and we finally have a review of taco truck. My cousin Christopher recommended this place to me although he didn't know its official name. He just knew it as "the pink taco truck." 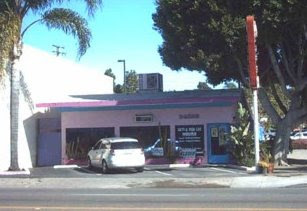 Its official name is Alebrije's Grill and it is near the corner of Pomona and Sycamore in Santa Ana, which is near the southwest corner of Main and Edinger. 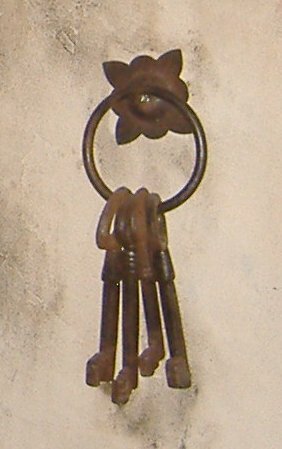 I don't know if it ever moves. At least my cousin has never seen it not in its usual spot. If you use the Yahoo! Map widget above the directions will get you within about 75 yards of the truck. Both were excellent and the lengua taco may have been the first taco I've ever had that was served in not one, not two, but three tortillas. The tortillas were so good that if they packaged them (and I don't know that they don't) I'd buy a few dozen every month. The lengua taco had a full meaty flavor without reminding you of the sensation you get in your mouth when you bite your tongue that I've experienced with other lengua tacos before. These next two pictures, of my quesadilla and of one of his tacos, were taken by Chris, who is a professional photographer. I always wonder if Chris is critiquing my photography whenever he looks at my blog. The quesadilla is filled with mushrooms and what seemed like a Oaxacan cheese. I'll be making more trips to "the pink taco truck" when I can but if it ever wants to drive over to my place in, ahem, Irvine I'll be coming right out with my dolares to get that quesadilla de hongo again and some of those alambre tacos I'm waiting to try. 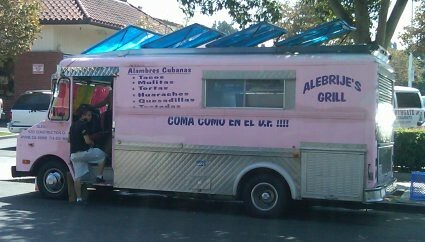 UPDATE: Alebrije's now has a second truck that is usually parked on Cubbon St. between Main and Sycamore in Santa Ana and they say they have a third one on the way. Click here to see the unedited photo album (29 photos so far) at . Read ElmoMonster's review here. His review links to even more reviews. This is NOT the only taco truck in OC we have covered. 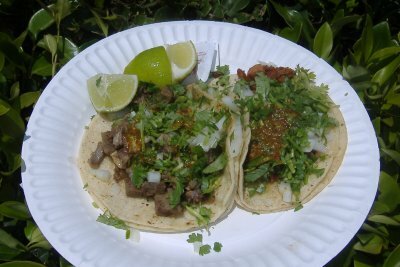 Click HERE or on the 'taco truck' label below for our complete coverage of Orange County taco trucks.